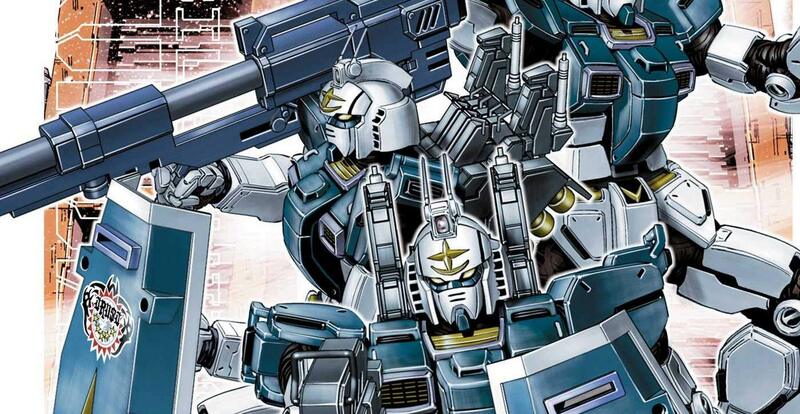 Mobile Suit Gundam Thunderbolt Vol. 10 Review – AiPT! I only really got into giant robot stories as an adult, so I never bothered with any of Gundam’s various series while I was growing up. Last year, though, I got my first taste of the franchise with Mobile Suit Gundam Thunderbolt. Boy, did it make an impression. Creator Yasuo Ohtagaki’s keen eye for visual details and his focus on the moments of calm between war battles instantly sparked my interest. I’ve been keeping up with the manga ever since and its latest installment, Vol. 10, was recently published by Viz Media. Is it good? This series’ visuals continue to be one of its main highlights. The establishing shots during scene transitions here are ridiculously good. Ohtagaki frequently delivers shots of various cities and ships from a variety of angles and wide pans, imbuing the settings with great atmosphere. Some of my favorite examples of this are panels depicting giant airships hovering over residential streets. The contrast between the sci-fi tech and ordinary clotheslines and fences conveys the sense of imposing dread caused by war very effectively. The shadows the ships cast upon the ground are terrifying even in their stillness. The inking in moments like this is also heavy, further contributing to the tone. So far I’ve focused mainly on transitional panels, but the art in scenes proper also impresses. The Gundams here look cold, sleek, and huge; they’re truly imposing futuristic weapons. There are some excellent shots of Gundams fighting in the dark where effective use of blank space casts the events in shadows, with just enough illumination in spots to showcase the striking physical impact of the robots’ attacks. There’s also some beautiful nature imagery in spots which helps remind one of what the characters are fighting for, and that there’s a living world being affected by the warfare. Ohtagaki’s renderings of humans are also well-done. They’re more cartoony than the intricately detailed machines and settings around them, and their facial expressions are very emotive. Story-wise, most of this volume takes place in the lulls between skirmishes. On the plus side, this allows for scenes showing how characters relax and ruminate when they don’t have to worry about rushing off into battle. This results in some charming exchanges between teammates, and the dialogue throughout flows smoothly and believably. Most of the characters have fairly well-rounded personalities, but their actions remain pleasantly unpredictable. On the down-side, what we get instead of combat doesn’t stand out very much. While the small character moments are nice, they seldom get much better than that. We don’t learn much new about any of the protagonists or antagonists, and there aren’t any emotional moments that really punch you in the gut or trigger any other strong reaction. It’s still an enjoyable read, but I’m not going to remember much of what actually happened in it for very long. There are also some occasional clarity issues in the art, although these are few and far-between. Mobile Suit Gundam Thunderbolt Vol. 10 is a good volume overall, it’s just not a great volume. The artwork impresses on almost all fronts, and there are some charming laid back moments between characters. Unfortunately, the plot is far from memorable and there are some occasional clarity issues. I would still recommend this volume to fans of the franchise, but I wouldn’t call it a must-read. The artwork impresses on almost all fronts, and there are some charming laid back moments between characters. Unfortunately, the plot is far from memorable and there are some occasional clarity issues. I would still recommend this volume to fans of the franchise, but I wouldn't call it a must-read.